Lauree Ann Duprey-Reed, Trivedi Global Inc.
Poor bone health is related with various bone disease that predisposes to fractures, while sufficient supplementation with calcium and vitamin D suggested prevention of bone diseases. 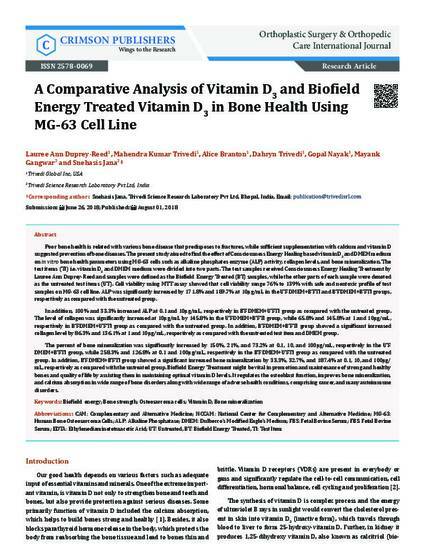 The present study aimed to find the effect of Consciousness Energy Healing based vitamin D3 and DMEM medium on in vitro bone health parameters using MG-63 cells such as alkaline phosphates enzyme (ALP) activity, collagen levels, and bone mineralization. The test items (TI) i.e. vitamin D3 and DMEM medium were divided into two parts. The test samples received Consciousness Energy Healing Treatment by Lauree Ann Duprey-Reed and samples were defined as the Biofield Energy Treated (BT) samples, while the other parts of each sample were denoted as the untreated test items (UT). Cell viability using MTT assay showed that cell viability range 76% to 139% with safe and nontoxic profile of test samples on MG-63 cell line. ALP was significantly increased by 171.8% and 189.7% at 10µg/mL in the UT-DMEM+BT-TI and BT-DMEM+BT-TI groups, respectively as compared with the untreated group. In addition, 100% and 33.3% increased ALP at 0.1 and 10µg/mL, respectively in BT-DMEM+UT-TI group as compared with the untreated group. The level of collagen was significantly increased at 10µg/mL by 145.8% in the UT-DMEM+BT-TI group, while 65.8% and 145.8% at 1 and 10µg/mL, respectively in BT-DMEM+UT-TI group as compared with the untreated group. In addition, BT-DMEM+BT-TI group showed a significant increased collagen level by 86.3% and 136.1% at 1 and 10µg/mL, respectively as compared with the untreated test item and DMEM group. The percent of bone mineralization was significantly increased by 150%, 21%, and 73.2% at 0.1, 10, and 100µg/mL, respectively in the UT-DMEM+BT-TI group, while 258.3% and 126.8% at 0.1 and 100µg/mL, respectively in the BT-DMEM+UT-TI group as compared with the untreated group. In addition, BT-DMEM+BT-TI group showed a significant increased bone mineralization by 33.3%, 32.7%, and 187.4% at 0.1, 10, and 100µg/mL, respectively as compared with the untreated group. Biofield Energy Treatment might be vital in promotion and maintenance of strong and healthy bones and quality of life by assisting them in maintaining optimal vitamin D levels. It regulates the osteoblast function, improves bone mineralization, and calcium absorption in wide range of bone disorders along with wide range of adverse health conditions, comprising cancer, and many autoimmune disorders.